Recorded by Sheila Majid, Malaysia's Queen of Jazz, in her 2003 album “Cinta Kita”, “Cobalah Bertahan” inspires the listener not to give up in the face of adversity. 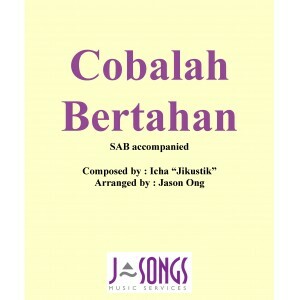 With a beautiful melody by Icha “Jikustik”, this arrangement includes an optional solo line for the opening verse. Due to copyright, please ensure that the score is purchased for every single member of the group/choir. To order desired quantity of item, please click on the "cart" button and enter desired quantity under the "Qty" heading.